Though our eyes are one of the most important parts of the body, we tend to abuse them sometimes. When we use our eyes excessively without giving the proper care and rest that they deserve, they could get exhausted and exhibit symptoms such as burning and watering. In some cases though, one eye that is burning and watering is not just simply caused by tiredness or irritation. Read on to know the possible conditions that are associated with this symptom. One Eye Burning and Watering, Why? 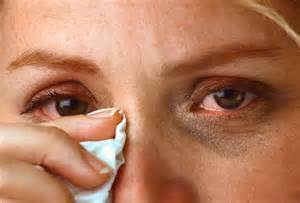 There are several causes of burning and watering eyes, ranging from simple to complex. Though frequently, it is caused by unavoidable environmental influences, such as high pollen counts or strong winds, such symptoms can also be caused by more serious eye problem and other medical conditions. People who are suffering from dust allergies find their symptoms worsen when they are inside other people’s homes and even in their own homes. More often, their condition can be triggered during or immediately after sweeping, vacuuming and dusting. Treatments: Reduce your exposure to indoor dust and avoid things that can trigger your allergic reaction. Over-the-counter medication such as antihistamines and decongestants can also be prescribed to provide relief from the symptoms. This can be any object that enters the eye from outside of your body, from dust particle to a metal shard. Treatment: Wash your hands first and use a bright light to examine the affected area. How you remove the foreign object varies according to the type of object and where it is located in the eye. This is usually associated with other allergic conditions particularly atopic eczema (dermatitis) and hay fever (allergic rhinitis). Typical symptoms include redness, itching, burning and clear, watery discharge. Treatments - The first approach is to avoid being in contact with things that can trigger the allergy. Stay indoor as much as possible especially during the mid morning and early evening where pollens are at their peak. For short-term relief of symptoms, you can use oral medications and nonprescription (over-the-counter, or OTC) eyedrops. Smoke inhalation happens when you inhale in the products of combustion during a fire. Signs and symptoms of smoke inhalation include shortness of breath, cough, headache, hoarseness, and acute mental status changes. Treatment: For providing care at home, remove the patient from the smoke area. Provide CPR if necessary until professional medical help is provided. Medical treatment such as oxygen, Bronchoscopy, Hyperbaric oxygenation (HBO) may be provided to the patient. Also known as allergic rhinitis, this is caused by an allergic response to airborne substances, such as pollen and inhibits symptoms similar to that of a cold. Treatments: Manage hay fever with the use of over-the-counter medicines such as eye drops, Antihistamine sprays or tablets, Nasal corticosteroids and Oral corticosteroids. Your immune system defends your body against foreign particles such as allergens. Allergic reaction happens when your body reacts to allergens. Mild allergic reactions can inhibit symptoms like itching, hives, rash, nasal congestion, watery or itchy eyes and scratchy throat. Symptoms of severe allergy include diarrhea, abdominal pain or cramping, fear or anxiety, dizziness, difficulty swallowing and breathing, weakness, heart palpitation and wheezing. Treatments: In most cases, mild allergic reactions are controlled with the help of over-the-counter antihistamines, such as diphenhydramine (Benadryl). Seek medical attention immediately if you or someone you know is having severe allergic reaction. This is an infection or inflammation of the transparent membrane (conjunctiva) that covers the white part of your eyeball and lines your eyelids. Common symptoms include itchiness and redness in one eye or both, tearing, discharge in one or both eyes and a gritty feeling. Treatment usually focuses on providing relief from the symptoms. Your doctor may recommend to use a wet cloth to clean your eye lids, use artificial tears, and apply warm and cold compress several times in a day. Most cases of this condition are caused by a mosquito-transmitted virus. Mild infection can cause signs and symptoms including headache, fever, body ache, diarrhea, vomiting, skin rash and one eye burning and watering. Symptoms of severe infections include stiff neck, high fever, muscle jerking or tremors, confusion or disorientation, seizures and muscle weakness or partial paralysis. While most people get better without treatment, hospital therapy with pain medication and intravenous fluids are required for those that have severe cases. Over-the-counter medicine to aid headaches and muscle aches can also be provided for mild cases. Also known as pertussis, this condition is an infection caused by bacteria that gets into your throat and nose. During the early stage, you will exhibit the same symptoms of the average cold such as runny nose, mild coughing, sneezing and low fever. On the 7th to 10th day, you will experience coughing spells that end whooping sound as you try to breathe in the air. Antibiotics is often prescribed to relieve cough and other symptoms. This serious condition is a type of glaucoma that affects children between birth and 3 years. Other symptoms such as redness, cloudy cornea and one or both eyes that are larger than normal may show if the condition becomes worsened. Surgery is the first choice of treatment. If the surgery can't be performed right away, the doctor may prescribe eye drops.